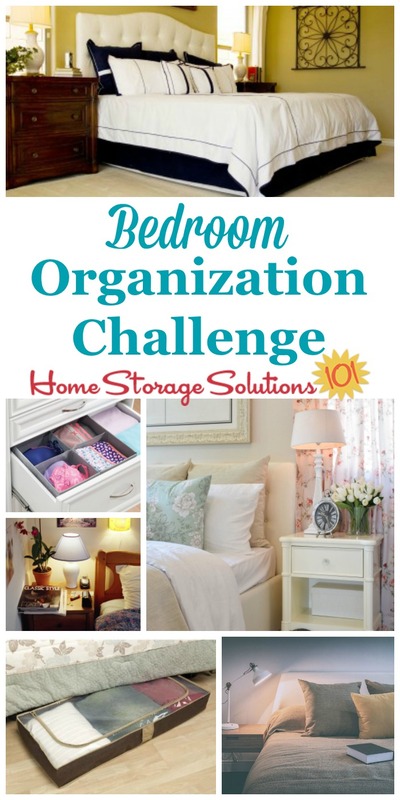 This week's challenge is all about bedroom organization, and getting the room functioning as an inviting place to take refuge from the world. Specifically, this week we're focusing on the master bedroom, since later in the challenge we'll work on organizing the kids' bedrooms. Along with organizing the stuff in your bedroom we'll also continue organizing our clothing, since many people keep clothes not only in their closets but in their bedrooms as well, such as in dressers, shelves or drawers. When you finish this week's tasks, if you've been following along you should feel like your clothing is now more organized and under control. Are you new here? 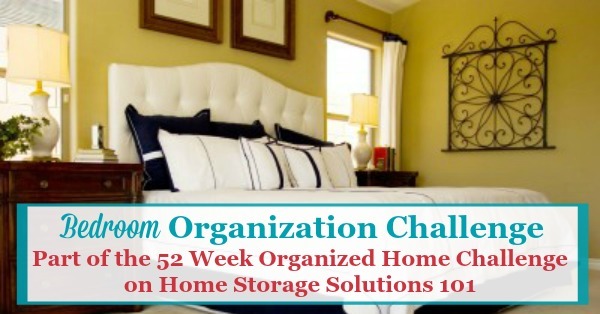 The Master Bedroom Organization Challenge is part of the 52 Weeks To An Organized Home Challenge. (Click the link to learn how to join us for free for future and past challenges if you aren't already a regular reader). The first step in the Master Bedroom Organization Challenge is to decide on the functions of your bedroom. This one may seem rather obvious, sleeping, of course. Well, that is definitely true, and you should make your bedroom a space to rest and relax as its primary function, because sleep is good! You need sleep to function properly. However, many of us don't have space or inclination to only have our bedrooms be used as a place to sleep, but instead we do additional activities in the room, or use it for other functions as well. Relaxing, watching TV, reading, listening to music, etc. Only you can decide what the functions of this room will be for you, but make sure they don't conflict with the primary function of resting and sleeping. For example, some of the other activities listed above could potentially cause a conflict with your ability to rest in the room, such as if you stay up too late watching TV in bed, or working on your laptop. When you organize your bedroom try to make sure considerations of your health and physical pampering play a big role in how you get the room in shape. The second step in the Master Bedroom Organization Challenge is to declutter the room of all things that don't belong in your house, in general, or in the room, in particular. I have found that when you have a clear purpose in mind of how you want the room to function this task is easier, at least in determining what doesn't belong in the room itself. Use these 9 questions to ask yourself when decluttering clothes to decide which clothing items you should get rid of, such as those stored in dresser drawers or a wardrobe. In addition, you can check out my full list of bedroom and closet clutter to consider getting rid of here. Once you've gotten rid of excess clutter in your bedroom, the next step in the Bedroom Organization Challenge is to create an activity zone for each of the room's functions. This is where you'll really think through the equipment and supplies you need for each activity you do in this room, and get everything organized so it is all easily accessible, and in a convenient location. Here's an example of what I'm talking about, to give you an idea of the thought process for each zone you'll create for the functions you identified for your room. If you get dressed in your bedroom each day, it can be helpful to have a hook where you can hang your pajamas and robe each morning, so they can be used again that evening That way they don't just get thrown on the floor or the bed each morning. Further, you may want to think of a place to put a full length mirror where you can evaluate your chosen outfit, and make sure all is well with what you've put on before walking out the door. Similarly, for your "sleeping" zone make sure you've got a cleared off bed, dark curtains at the windows to block out light, and anything else you need for a good nights sleep. Thinking through each step of your typical routine for each activity or zone will quickly help you identify what needs to be done to make the space function optimally for such activity. As you work through the Bedroom Organization Challenge, keep these suggestions for storage solutions in mind, to see if any of them might work for you. While this week we're focused on your own bedroom, and a later challenge is devoted to kids' bedrooms, a bonus mission you may need to do, in your own home, is to declutter and organize your guest bedroom, or spare room. Naturally, since it's a whole room it will take some time to get it all organized, especially when often these types of rooms, if you're lucky enough to have one, also serve a dual function, such as also being a home office or craft room, for example. 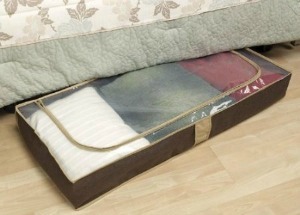 If you've got a guest room in your home, make sure sometime soon to make time to get it decluttered and organized. You can get tips for how to declutter your guest room here. Further, once you've got it decluttered make sure to check out these guest room ideas and essentials that will make this room cozy and comfortable for your overnight guests. If you've got time this week after you've decluttered and organized your bedroom I suggest you also give this room a deep cleaning. Lots of dust is found in your bedroom, and you spend a LOT of time in there to sleep, if nothing else, so giving it a good cleaning will provide a lot of benefits for you. Here's my article on the sister site Stain Removal 101, where I've listed the 10 things you don't want to forget when you deep clean your bedroom. 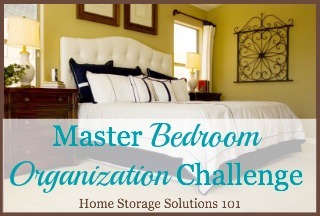 I would love to know how this week's Master Bedroom Organization Challenge is going. You can tell me your progress or give me more ideas for how you've organized this area of your home in the comments below. I also would love to see before and after pictures of your bedroom once you've completed the challenge. Submit your pictures (up to four per submission) and blog posts and get featured in the Creative Storage Solutions Hall of Fame. You've worked hard to get organized, so now here's your chance to show off! We're working on our homes slowly, one area at a time, so don't get too distracted from this week's Master Bedroom Organization Challenge. However, I know you like to know what is coming up, so I'll tell you. We're going to continue working on our bedrooms and closets next week by focusing on organizing jewelry and accessories.